dull roar: Fun with Fractals! 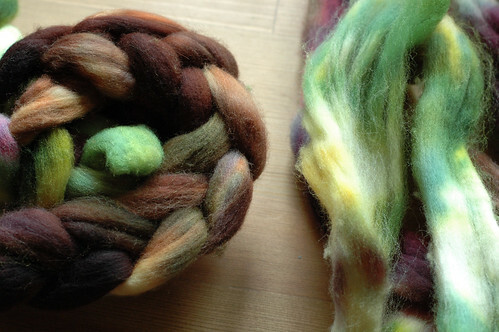 You split your roving in half. One half, you spin up as it is, from one end to the other. Second half, you tear into a bunch of strips, and spin up one after the other. In theory this gives you one single with long color areas, and one with short, and they line up nicely and are pretty or maybe stripe in a nice way, or something like that. I've read a lot about it, but people can't seem to give me a definitive "why you should do this" or a good comparison of methods. So I will find out myself. Since I wanted to compare my two methods, I started by splitting the whole thing in half and braiding one half. This is my "normal, center-pull willy nilly" roving. So you've got Big Braid, Small Braid, and Haggard Ball. 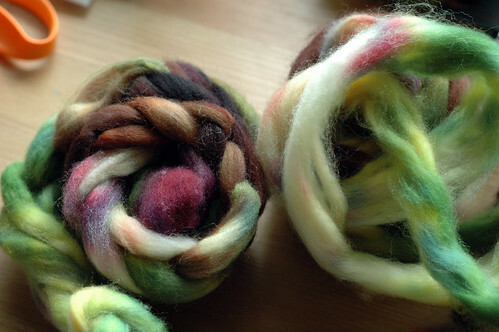 I spun up the big braid as I usually would, tearing it into a few strips, starting from whichever end I felt like, and then putting it on the ball winder and plying from the center pull ball. Then I spun one bobbin of the small braid, drafting straight from the braid and not tearing into strips (which is sorta hard for me, I should work on that.) Then, another bobbin working from the haggard ball of strips. I wish I could say I did the small braid and the ball from the same end, colorwise, but I'm not sure if I did. I plied those two together. 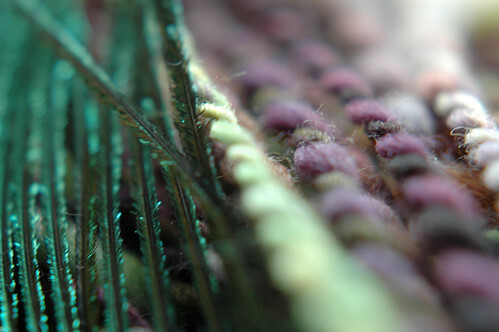 Then, I futzed around with my macro filters for a while. Conclusion: It doesn't really matter!! At least not in this case. Maybe I'll try it thinner sometime. 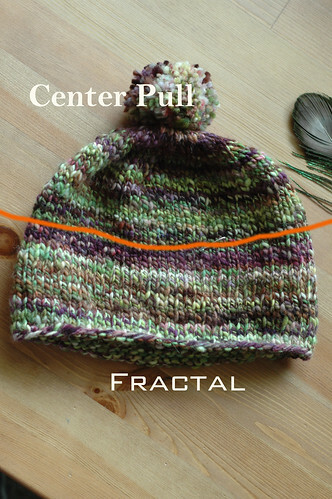 Or combine the two, and do a center-pull ply, but split the roving in a fractal-ish fashion. 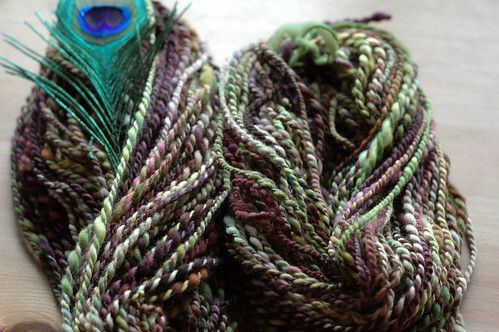 I do like the whole not-wasting-yarn thing. But hey, I'm diggin' this hat. Also, pompoms. Very into pompoms right now. man, pom-poms are /such/ a thing right now-- I blame the yarn harlot for putting them on everyone's mind. 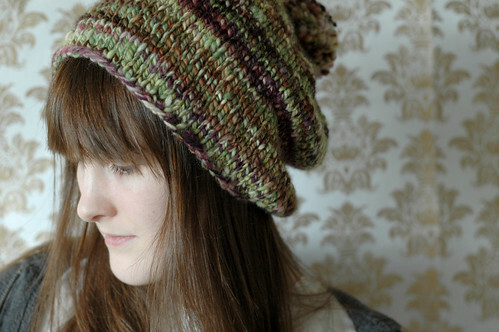 your hat & handspun are super-good-looking. keep up the good work! love that hat!! 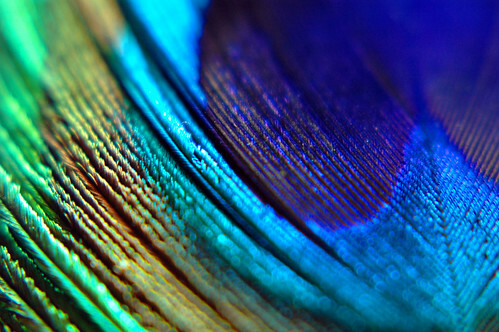 and those photos with the macro and peacock feather are incredible. bah! i cannot believe you already made a hat. i'm looking at my two skeins and have no idea what to do with them. 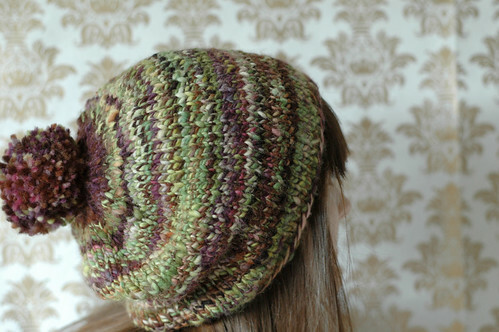 handspun pom poms are to die for, i must say. 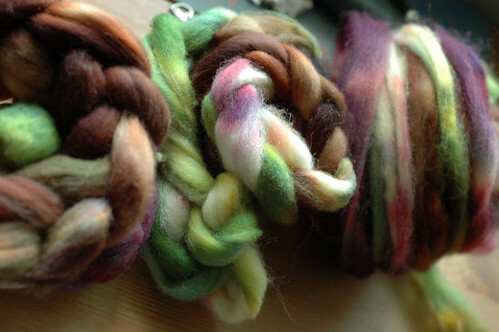 dang girl, you make a body want to dust off her spinning wheel...and supply you with tons of handspun yarn! hm, wasn't there a rumor of a birthday...? And yes, this is the best pompom EVER. It is so squishy and succulent. Way cool that 1)you can do all that, and 2)that you took time to share it. It makes me want to be able to spin. Oh, and have a macro lens. oh em gee want want waaaaaant!!! I don't spin, but it was interesting to read your comparison of two techniques. 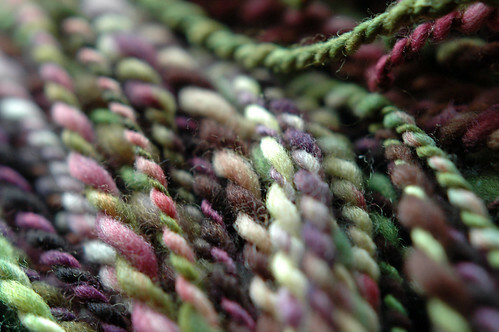 I love the colors of the finished yarn!